The RO16 of the SC2Improve Summer League is now over and after four action packed groups we have eight players moving on into the RO8 : Noname, Adonminus, Qxc, Lucky, Tefel, Storm, JonnyREcco and Satiini. An amazing line-up for the RO8 of our event - something far beyond I could have imagined - but just incase you missed how these guys made it through to this point we have a little recap of each group for you all! Today we’re going to be looking at Group A - with a new recap each day up to the first set of RO8 games on Monday! Group A was a group with two different story lines leading up to it. The first being whether or not there would be anybody who was going to upset Qxc from advancing in first. The other being the fact that this was probably the only group where there were not two clear favorites going into it. Qxc lived up to his reputation and cruised through the group without dropping a map - but he definitely did it in style. 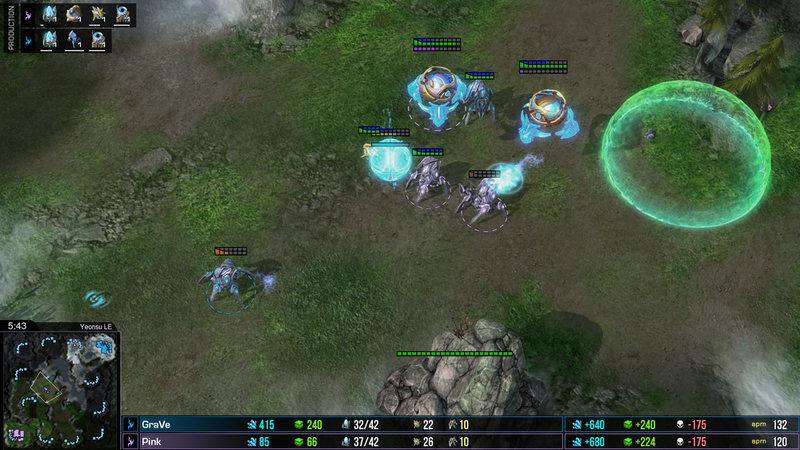 He wasn’t afraid to use different and non-standard builds in order to advance as he used a mixture of proxied Reapers, Proxy 2 Rax, Gas First TvP and CC First TvZ builds to secure his way into the RO8. It was fantastic to watch simply because it was a step away from the current mostly stagnant meta-game in TvP and TvZ. It’s going to be exciting to see what other tricks he pulls out when he goes up against Lucky in the RO8. So one story line didn’t bring anything unexpected to the table - but we still had three players who were looking for that second place in the group. At the start of the day we saw Storm perform a 2-0 stomp on Pink with fantastic defenses followed by counter attacks, putting Pink down to the loser’s bracket to play against GraVe. As game one developed it became clear something was off for GraVe - initial trades in the middle of the map looked to be going well for him but Pink soon arrived with reinforcements while managing to get his Mothership Core away with one hit left to die. This combination of wasted DPS by GraVe and additional DPS from Pink was too much and GraVe had to fall back to his expansion. While both players expansions came up at a similar time we saw different tech routes for either player with GraVe heading into a Stargate and Pink into Immortal production with the Robotic’s Facility. Unfortunately for GraVe his investment into two Oracle’s did not pay off for him and a big attack from Pink caught him in an un-holdable position and force him out of Game 1. Game 2 was over in a flurry as GraVe walled his opponent in with a Proxy 2 Gate. Pink spotted it in time and with sufficient micro dealt with the threat and knocked the Polish Protoss out of the tournament. Early game confrontation : initially things were going GraVe's way. Battle of the Danes Part II. At this point in the day I think most were expecting an uneventful 2-0 in this Pink vs Storm rematch to ease Storm into the RO8 - but it was far from anything. Pink changed up his style, opening with a FFE and following with a Stargate on Bel’Shir Vestige. Heading straight into Void Rays it was clear Pink wanted a macro game as he moved over to take his third base while adding his second Stargate and teching into a Robotics Bay to add in Collossi. Storm was playing a Ling-Hydra style and thought he had an opportunity to sweep in from two angles - but Pink’s forcefields were on top of things and Storms army melted leaving him 4000 resources behind in the resources lost count. From here Pink was far ahead and closed out the game with a second defense and an attack across the map which struck too early for the Muta tech-switch to have any chance of pulling Storm back. Game Two took us back to the Gateway expansion play by Pink and as he did in the previous series opened with 3 gateways of pressure onto Storm’s third. Storm lost his third to the Zealots, already a bleak start for our Zerg. Pink went into a Stargate behind this and made it clear that he wanted to move into the RO8 in the next few minutes as he added on Gateways before moving out for a large 7 Gate + 4 VoidRay attack. It hit hard, melting Storm’s third base in seconds. It really did look like it was all over for Storm as Pink headed towards the natural. But somehow Storm pushed it back - 3 spore crawlers and a spine alongside Queen’s and Roaches held for a few extra moments while Hydra’s came out. Hydralisks were definitely what Storm needed - but was it too little too late? He was still losing supply, as Pink with 7 Gateways of production was out-producing the 2-Hatch Zerg - but he bought time. Pink lost a VoidRay to a spore crawler. A clutch transfuse kept one of the spores alive and another died but not before reducing the Void count to 2. Then 1/1 kicked in for Storm. He pushed forward with his units, the Voids melted with the help of Queens and the Gateway units slunk back. Pink had over committed into the static defenses of Storm and now had Storm’s counter attack knocking on the front door of his wall and a GG was soon to follow evening the series 1-1. Pink looking as though he had just too much for Storm to deal with. Game 3. All or nothing. Pink opened FFE to protect from the potential ling flood we saw on Whirlwind earlier in the day. Pink then follows up as he did on Bel’Shir - but Storm didn’t. Storm identified the weakness to his opponents build - the lack of complete commitment to Void Rays and he struck with a huge Roach-Ling-Queen bust just before Collossi could come and make a difference. He pushed forward and Pink, realizing moments beforehand that he was in trouble, was desperately adding cannons to buffer his defense and choke the Zerg army up. But it didn’t matter. There was just too much and Pink found himself very quickly at a third of the supply of his opponent, typing out GG and Storm was left to celebrate his advance into the RO8. Qxc and Storm advanced. Qxc a favorite - Storm the underdog. Both will be tested in the RO8 - but will either of them have enough to make Finals Day? Qxc plays Lucky on Monday 16th September 1900 CEST and Storm plays Tefel on Thursday 19th September 2030 CEST.